Over the summer, The Washington Post uncovered a secret project the CIA began developing in 2005: a custom-designed propaganda figure of Osama bin Laden that is sure to haunt your dreams. Code-named operation "Devil Eyes," the figure&apos;s face looks just like the evil man himself. When exposed to heat, however, the paint on the toy&apos;s face peels away to reveal a horrifying demon with green eyes, red skin, and black facial markings all over its face. The whole idea behind the project was to scare children from joining al-Qaeda. In the end, the CIA decided to scrap the project. Thankfully, no child ever had to experience these horrific figures. That&apos;s not to say that models were never made. The CIA hired Donald Levine (a Hasbro executive who helped create all the G.I. Joe toys from our childhood), who had three prototypes created in China. While two of them remain with either the CIA or Pentagon, one now lies in the hands of a private collector. No one knows how, but one of the figures ended up in a Nate D. Sanders auction that took place this past Thursday. Bidding for the demonic doll started at $2,500. It eventually sold for $11,879. 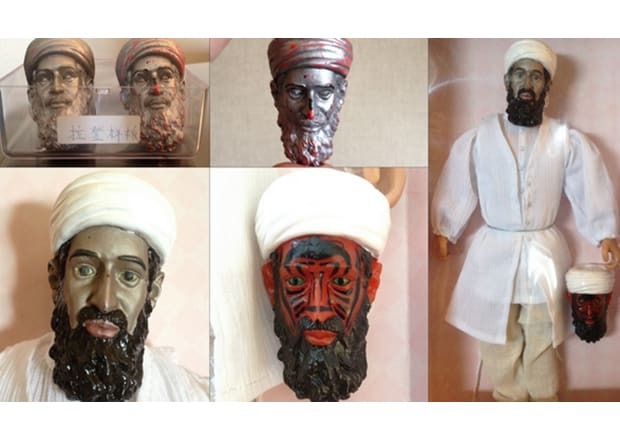 Why anyone would want a toy Osama bin Laden, especially one this terrifying, is beyond us.